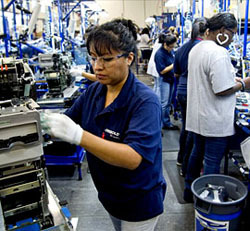 The manufacturing sector has much growth potential as the methods of creating a product get more refined. It is dynamically changing providing varieties of opportunities for job seekers. It has several job profiles for many industries, and also provides scope for career advancement. Every role comes with specific responsibilities and different levels of operations. With new technologies and automation revolutionizing the manufacturing sector, the need for skilled professionals has gone up. Because of these changes, the resume has undergone minor changes. To get a job in this industry, your resume needs to reflect those changes. For people who are proactive in nature, the manufacturing sector offers job security if you are proficient in different cutting-edge technologies. Listing bullet points in your resume that convey you are adept at using these technologies can create an impression on the hiring managers. This sector provides an individual with diverse career growth options as he is bound to be in close touch with the latest technological developments. Irrespective of the kind of job you choose, one needs to prove why he is suitable for the job. Therefore, whether you are just starting your career in this line or aiming to become a quality analyst manager, you first need to draft a precise resume that sells your worth to a prospective employer. Our manufacturing resume samples for different profiles illustrate how you should design your resume to the point to make the right impact. As in the manufacturing sector, different processes are streamlined on the shop floor to assemble a product, similarly, your resume must be written in a precise format to convey your key highlights in a straight-forward way. Avoid writing lengthy documents that include all history from graduation to the present. A single page or at the most double page to include your 20-plus years of experience is sufficient to sell yourself to the employer. Decide on whether you want to project your skills first or the chronological work history before beginning to draft your resume and then select the appropriate format. Any hiring manager needs information to connect to you in case you make it to the shortlisted group of candidates. Provide your full name, permanent residential address, own mobile number and an email address that looks professional. Write this at the top your document which makes it easier for the hiring manager to locate your name when there are hundreds of other applications. Gone are the days of writing a job objective which emphasized you desperately seeking for a job. As the number of candidates for a single post is high, you need to demonstrate why you are more capable than others. The best way to show this is through writing a 3-4 lines career summary which talks about the skills, big projects and honors which is quite close to what an employer has mentioned in the job description. Any recruiter is looking for a certain set of skills that is a prerequisite for a profile. A candidate who demonstrates expertise in those skills will be given a higher preference as compared to others. It is a win-win situation for both, the employer and candidate. The training cost required for a newcomer is nullified, and the candidate stands out in the crowd. Hence, always remember to include the technical skills, equipment and machinery you have operated or expertise certifications obtained in handling them in the skills section. Write your previous work history in bullets using the right action verbs. Highlight major projects and include quantitative bullet points. When your statements in this section consist of equipment names or figures about a project, a recruiter is likely to remember your application in the back of his mind. Try using action verbs at the beginning of bullet points such as assemble, analyze, construct, compile, coordinate, design, inspect, investigate, process, resolve and many others. Even if you are at the senior most position, any employer would like to see your educational background and other aspects of the personality. Write the highest degree qualification, university name from where you got it and when you received it. You can also include other sections like honors or awards received, professional certifications, volunteer activities and other interests. However, mention only those points which are relevant to the job you are applying for. These key points will help you write a winning manufacturing resume as well as demonstrate your knowledge and work experience. When it comes to the manufacturing sector, hiring mangers are looking for something more than a generic resume. So use resume samples given below specific to your job profile and get employed.